Telephone befrienders call out to older people at a pre-arranged time to check that all is well and for a good blether. Over time trust and meaningful relationships are built to become a friend who can be a listening ear who can give emotional support in difficult times. "I can share a problem, ask advice and they will help if they can. If I worry about something or don't feel too well I have someone who'll listen. That makes a big difference." Details of nominated contact persons are held e.g. next of kin, the GP, clubs attended and any service which visits the house. When a client fails to answer their Good Morning Call, the service will try to locate them. Both GP and hospital appointments are checked. When a member cannot be found and their safety verified the service will alert a nominated contact person or Police Scotland. Help will be sent, 365 days a year. Hospital discharge dates can be co-ordinated with in order to resume the Good Morning Support Calls as soon as the person is home. Police Scotland give the charity warning of bogus caller conmen operating in the area. Befrienders pass this on to members along with a positive re-enforcement message of good doorstep management. As the fear of crime can be debilitating, care is taken not to alarm anyone. The Police highlight the important role of GMS in raising awareness to help prevent doorstep crime, working in partnership at roadshows and exhibitions throughout the year. Members have the opportunity to meet up with each other and befrienders at social outings each month. Places of interest visited include: STV studios, Kelvingrove Art Galleries, Huntarian Museum, Botanics and Hidden Gardens. Local services/ events are promoted, e.g. Falls Service, Handyperson Service, My Bus, NHS course on managing long term conditions. Befrienders will signpost or refer members on where appropriate. Two editions are published, Glasgow and South Ayrshire, keeping members up to date on charity news, local services, readers' poems, recipes, and quizzes. Key NHS articles include info on diabetes, strokes and falls. 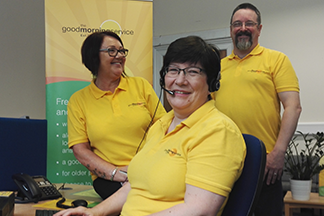 The charity makes sure telephone befrienders have an understanding of mental health conditions in order to better understand clients as well as to prepare staff for a crisis event on a Good Morning Call. Training programme includes: Applied Suicide Intervention and Support Training( ASIST), Scotland's Mental Health First Aid (SMHFA), awareness of multi-morbidity, dementia, and alcohol dependency in older people. One afternoon per month is set aside for continuous professional development. Telephone befrienders are drawn from the caring professions e.g. nursing, social work and the emergency services as well as the third and private sectors. It is a multi-skilled staff team. The greatest attribute befrienders have is patience. They are warm, caring people whose personalities shine through in every Good Morning Call. Befriending staff are the charity's greatest asset. Members of the Good Morning Service Team.